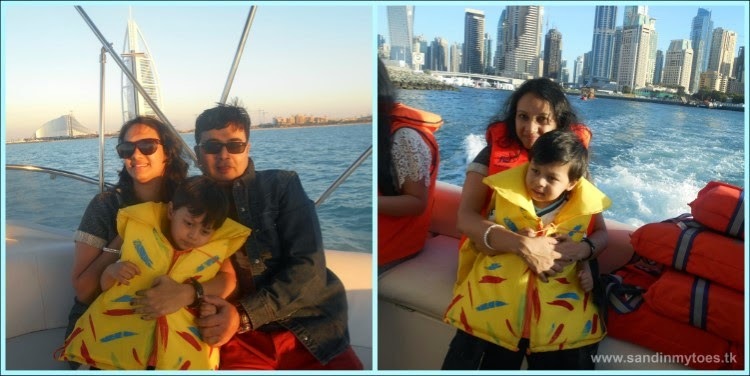 I have been on many traditional dhow cruises here in Dubai, but was yet to try a yacht cruise. We got to experience this recently when we tried the Sunset Cruise organised by Al Wasl Yachts. Our 37 feet long yacht called Al Shujaat-2 looked fancy, and definitely made me feel fancy too! Nothing better than whisking off into the sunset in a yacht, right?! It was pretty cozy inside, complete with a kitchenette, two small bedrooms and a sitting area. There was enough space for the six to eight people who were on board. We headed out of the Marina Lagoon at 5 PM to catch the sunset on Palm Jumeirah. The cruise would last for two hours. This was Little Dude's first yacht ride too, but since it was a windy day, he felt safer staying in the cabin! As we headed into the open waters of the Persian Gulf, the wind only got stronger and the boat rocked quite a bit. Luckily, we didn't suffer from seasickness (although some of our companions did! ), and rather enjoyed the choppy waters. We soon left the mainland, heading towards the Palm Jumeirah. For a while, the captain and crew considered turning back, but as we were in adventurous spirits, we decided to keep going. Soon, we were close to the iconic Burj Al Arab hotel. Beautiful piece of architecture, isn't it? Of course, the highlight of the cruise was watching the sunset and we witnessed it from the top deck, braving the cold winds! We soon crossed Atlantis The Palm, and decided to skip The World Islands on account of the weather. This sunset cruise is definitely one I'm going to remember. Best of all, we experienced it as a family. Little Dude was not too impressed about wearing the life jacket, as you can see in the photo below! But we were all required to wear them (except for a few minutes to take photos). The crew had been very attentive towards us, especially since we had Little Dude on board. By the time we returned to the Marina bay, it was twilight, at about 7 PM. A Sunset Cruise charter for a yacht of this size from Al Wasl Yachts costs AED 430, including light refreshments on board. See more details on the Sunset Cruise on their website. 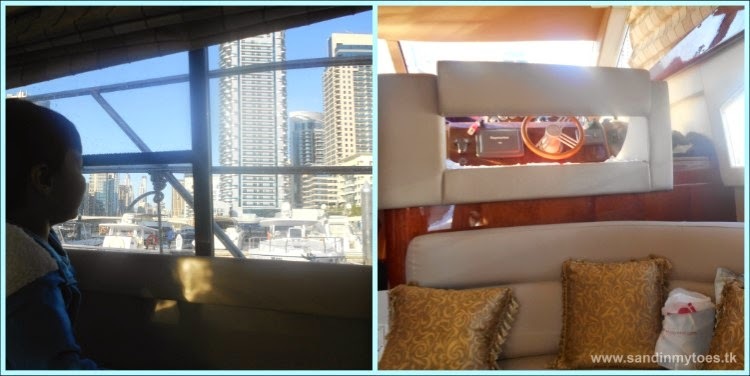 Al Wasl Yachts provide free pick up and drop for guests, and also full insurance to those using their services. Visit www.alwaslyachts.ae and www.partycruisedubai.com to find out about their fishing and luxury yacht cruise services. To make a reservation, call their 24-hour line on +971-4-2959477. We were invited aboard the Sunset Cruise by Al Wasl Yachts, but all views and opinions are my own. What a nice way to enjoy the sunset! I haven't been to any of these yacht cruises myself (only the traditional dhow ones) and this really sounds like a great idea, plus the weather is still so good. Thank you for sharing this, and have a good day, Tarana! What fun!!! Gorgeous photos, too! yea it is really fun..! !